This review originally appeared in the February 1998 issue (#114) of The New York Review of Science Fiction. 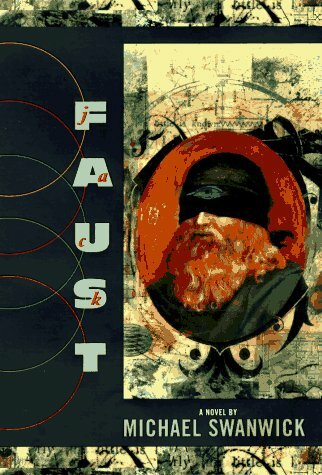 Since Christopher Marlowe penned Doctor Faustus in 1604, the story of Faust has been retold in many major guises from Goethe’s Faust to Gounod’s opera to Randy Newman’s concept album Faust. Those who believe that that any further retellings just waste our time should take a look at Michael Swanwick’s latest novel, Jack Faust, which is more of a modern, adaptation of the famous tale; rather than a modern retelling. As in virtually every other version of the story, Swanwick’s Jack Faust is a man who desires to learn all the intricate workings of the universe but feels constrained by the prejudices of those around him. Luckily for him, Mephistopheles comes to Faust and offers him all the knowledge in the universe. At this point Swanwick’s telling begins to depart from the norm. Now, Mephistopheles is a shape-shifting projection created by the collective intelligence of an alien species that wants to see the human race wiped out. This species feels that the easiest way to do this is to accelerate the technological progress of the human race with the belief that humankind, unable to properly handle knowledge, will kill itself off. Mephistopheles even goes so far as to tell Jack of his species’ plan when it makes its offer to Jack–after all, he did ask why this species decided to be so generous to the human race. However, Faust thinks a little more highly of humankind and essentially bets Mephistopheles that his species is wrong in its assessment of the human race. The novel then proceeds with Faust’s attempt to better all of humanity with his newfound knowledge. Here Swanwick’s novel even more dramatically departs from the traditional Faustian tale. Preoccupied with the betterment of humankind rather than gaining personal power (which he achieves as well,) Jack brings about the industrial revolution about 200 years earlier than it would naturally have occurred. Furthermore, this revolution—one for which society is unprepared, spiritually, religiously, legally, and politically—is condensed into a 40-year period. While this radically different industrial revolution moves the plot along, Swanwick tackles the questions of morality synonymous with the story. Criminals and shady characters inhabit major portions of Jack Faust’s world, and at times there is little to distinguish their actions from Jack’s-even though he sneers at their actions, he doesn’t seem afraid to use criminal methods when he feels he has no other practical options. Furthermore, he often dismisses the suffering and hardships his actions cause with an ends-justify-the-means belief that his actions will ultimately benefit all of mankind. Although Swanwick removed the personal religious implications of Faust’s deal with Mephistopheles (recall that he’s the projection of an alien species rather than one of Satan’s soldiers), the Church’s presence acts as a beleaguering conscience for Jack Faust. Throughout the novel, the church opposes him by fighting for the overworked factory laborers, by sending protesters to abortion clinics he helped found, and, more importantly, by excommunicating him and branding him a heretic for his views on God and the human soul. Even though Faust presents a legitimate threat to its power, the Church for the most part honestly seems to act in what it feels are humanity’s best interests. One focus of the morality investigation in Jack Faust is the matter of Margarita, Faust’s love interest. With his support, she transforms into a ruthless, almost-modern business woman who smokes, uses her power to circumvent the law as needed, seduces men (and occasionally women) as the need arises, and defies the Church and its preordained concepts of women and their place in society. However, despite the radical changes brought about by Jack, the society Margarita inhabits is not prepared for such a woman, and she is all too aware that her hold on power is tenuous at best. This characterization is a drastic change from the usual Faustian love interest; unlike the corrupted innocent normally seen in the story, Margarita has a dark side to her personality which she names Gretchen, and it is as Gretchen, a persona that Margarita embraces completely once she succumbs to Jack, that she becomes the ruthless business woman who corrupts and/or destroys those who come in contact with her. Along the way, Swanwick throws in some clever satirical touches ranging from the broadly comical to the subtle. For example, early in the novel, when Jack can get his inventions constructed only by convincing his investors of the military applications and/or the potential profits his machines present, he introduces the refrigerator. Nonplussed, the investors shrug it off by saying they know of no one who would be interested in such a contraption. Luckily for Jack, these investors brought their wives along, and they unanimously think that the refrigerator is a must-have item. On the subtler side, there’s the transformation of Margarita into Gretchen. While there is little humor in the change itself, readers familiar with Goethe’s version will recognize that “Gretchen” is the name of the innocent and pure woman whom Faust corrupts. Because it seems blatantly obvious that society would buckle under the changes brought on by an Industrial Revolution started 200 years earlier (the real one brought about social unrest that toppled governments as it was) and condensed into a 40-year period, such a scenario means that Jack Faust is an alternate history sf novel. However, while the European political stage is important to the novel, it does not dominate it. Instead, Swanwick focuses the novel on western culture and society in general, and on those whose lives Faust changed both directly and indirectly. As the rapid changes occur, the history in the novel, when brought to our attention, maintains an eerie resemblance to the history of our world. Through this resemblance, Swanwick’s “alternate” history seems to point where he feels today’s society is headed–it’s a bleak view suggestive of humanity’s self-destructing, but it seems inevitable given the course of events in the novel. Swanwick ties all these elements together into a powerful, thoughtful novel that is certainly a novel of our time. He shoves the early-renaissance concern with the fate of the immortal soul into the background while focusing on the moral and physical horrors made possible by technology run amok. Swanwick may have killed sf (as he claimed in NYRSF 109), but he has also managed to resuscitate the Faustian tale by bringing new (alien) life into his story. While doing so, he also manages to entertain us with an alternate past that presents a possible look at our own future and where we may be headed. This entry was posted in Book Review, Matthew Appleton, Michael Swanwick. Bookmark the permalink.